Teaching confusing words can be daunting for even a seasoned teacher. 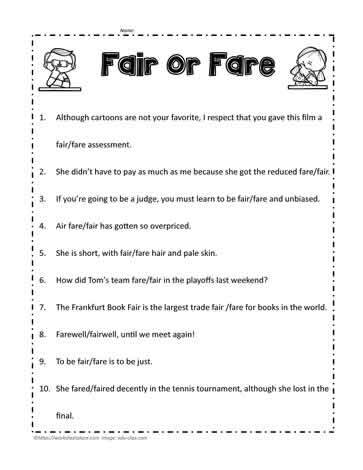 First teach kids the difference between fair and fare and then give them this sheet to practice. With lots of practice students will soon learn to distinguish what word to use. She didn't have to pay as much because she go the reduced fair/fare. Air fare/fair has gotten to be overpriced. Circle the appropriate spelling.